The Georgia Archives building was designed by A. Thomas Bradbury, the architect who designed many of the government buildings around the State Capitol. 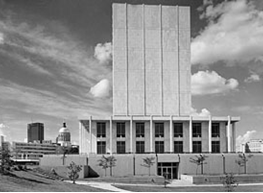 This Modern structure was completed in 1965 to house the permanent records that constitute the state's recorded history. The building was closed in 2003 when the Georgia Archives relocated its facilities to Morrow, Georgia. According to the State of Georgia, the building suffered structural damage from proximity to Interstates 75/85 and 20. A demolition permit has been issued but action has been delayed by a budget shortfall. Update: In March 2017 the building was demolished. The State anticipates construction of a new building on the site to house the Georgia Supreme Court and the Court of Appeals.